Automated fake news: the dark side of Artificial Intelligence? The Great Moon Hoax is considered one of the most sensational pranks of all time perpetrated by mass media. 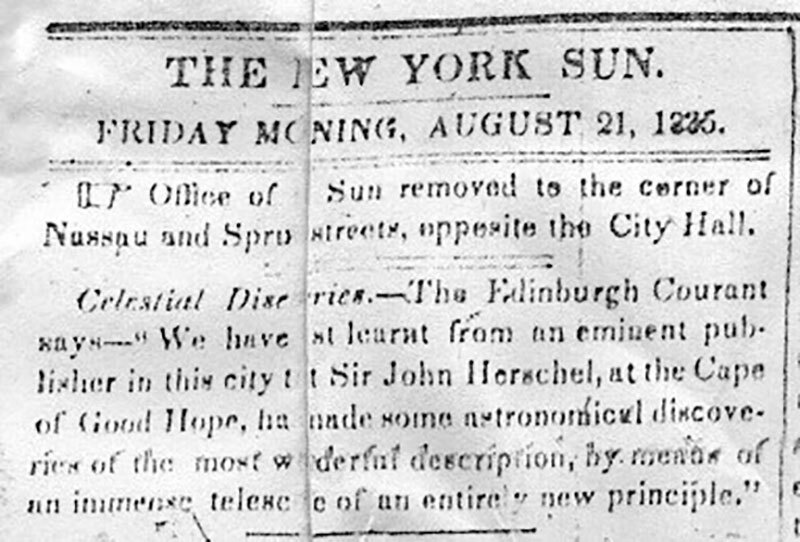 On August 21st, 1835, on the second page of the New York Sun, a small notice appeared, apparently taken from the supplement of the Edinburgh Courant. The text announces amazing astronomical discoveries that would have been made by the already distinguished Sir John Herschel through innovative techniques. BY SIR JOHN HERSCHEL, LLDFRS & c.
It is the first of a series of six articles1, which describes how John Herschel from the Cape of Good Hope (he had really been there), discovered new forms of life on the moon, between blue unicorns, winged men, and bouncing globes. The series is also translated the following year in Italian, and published as Delle scoperte fatte nella luna del dottor Giovanni Herschel. The author who is reporting would be a certain Dr. Andrew Grant, alleged Herschel’s traveling companion. Despite the suspicions of the New York Herald, the real author admitted everything publicly much later, in 1840. It was Richard Adams Locke, one of the two editors of the Sun. At that time the media was quite divided on the issue, but the coverage they provided did contribute to the general excitement that these “discoveries” created. Before 1830, such a prank would not have been even conceivable, and it was the first sensational demonstration of the power of the mass media that had arisen after the introduction of the steam-powered press. A century after Locke’s prank, it is no longer all about the press. Thanks to the radio, the mass media can now reach almost all American homes. October 1938, the international situation outside the United States seems to be on its way to the ineluctable. While the Civil War rages in Spain, the war between China and Japan is still going. Nazi Germany has been remilitarized and has already annexed Austria and the Sudeten without firing a shot. And the illusions of peace of Chamberlain are strongly contested by Churchill, who already fears the next claims on Gdańsk. It is precisely in this context that war also lands on American shores, with the invasion of New Jersey by … the Martians! On the night of October 30th, CBS is broadcasting live music from the imaginary orchestra of Ramon Raquello. The play, however, is interrupted after a few minutes by an “Intercontinental Radio News reporter” with an… unusual announcement. It seems that astronomers have just spotted a huge blue flame erupting from the surface of Mars. It’s just the beginning: soon a meteorite will be “sighted” falling into New Jersey. According to radio reports, Martians will emerge aboard of huge three-legged vehicles. The reports will follow each other frantically with fictitious interviews describing the catastrophic effects of the invasion. This is obviously a colossal prank, inspired by “The War of the Worlds”, a novel written by HG Wells in 1898. 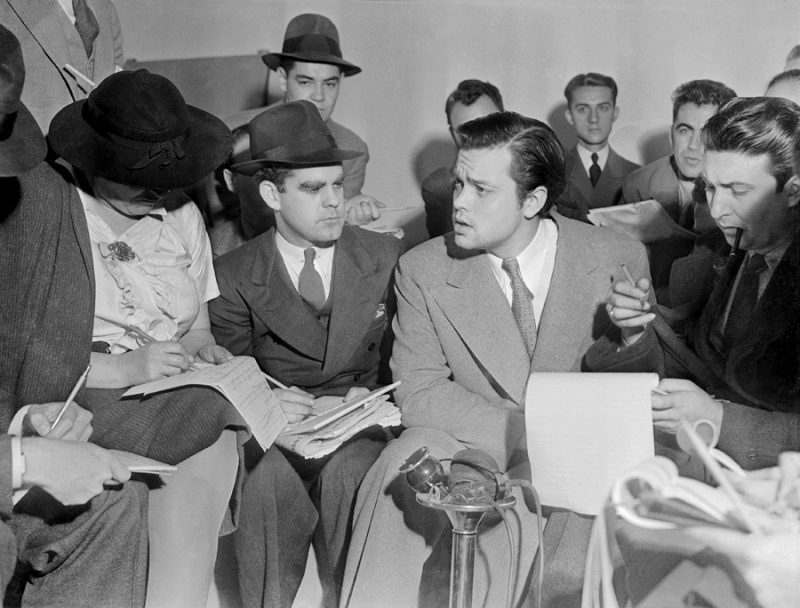 The whole apparatus was conceived and directed by Orson Welles, and half of the American population was thrown into total chaos… or was it? In this case, the “fake news” was actually two. One was the “live” story of the alien invasion, which still led several Americans to believe and rush into place armed and ready to fight the threat. The second was the myth, still solid today, of the nation-wide panic, with millions of terrified Americans. Once again the mass media do play a crucial role. The press who hastened to divulge the news of the hoax-generated panic, but this time heavily supported by an even more powerful and pervasive media: the radio. The world of pranks did not spare academic publications, either. In 1994 Alan Sokal sent to Social Text2 an article titled Transgressing the Boundaries: Towards a Transformative Hermeneutics of Quantum Gravity. The journal (which at the time was not practicing peer review) published the article in the spring of 1996. The peculiarity of the article was that it was composed entirely of meaningless sentences. The only requirements were that the words should sound good together and that the content was aligned with the journal’s ideology. Later on, Sokal declared on Lingua Franca, that article’s main purpose was to demonstrate the decline of the intellectual standards of the humanistic journals of the time3. Another interesting case happened in 2005, when three students from MIT replicated Sokal’s experiment, developing SCIgen, a rudimentary software that automatically generated “scientific” pseudo-articles. The purpose here was to bring to public attention the proliferation of unscrupulous “predatory” magazines. In fact, many of them, for a substantial price, would accept any kind of article without even reading it. Their website lists a number of other randomly generated items that have been published. Today, with the Internet, the concept of fake news has grown to a totally different scale. While the Internet itself does not reach more people than the radio does, it has radically lowered the entry threshold for publication. In the pre-Internet era, in fact, the mass media, was accessed by the masses almost only passively. Those who had the prerogative to broadcast content were very few. Today anyone can publish their own ideas, but above all the crucial point is that anyone can act as a sounding board, and the speed with which a news or a hoax can spread has become exponential. People like sensationalized news, they get clicks, and readers more often than not aren’t even interested in knowing if what they are reading is true. And this traffic generates revenue for the crafter of fake news, encouraging the production of fake news even more. So far, the fake news quoted were mostly due to errors or mistakes. At most (as for Sokal’s case), they were intended as a denounce. And then the campaigns of disinformation came out. That is, where the “fake” assumes a meaning of intentional harm toward someone. These “sounding boards” have become targets for the so-called “social bots”. Apparently, Chengcheng Shao from Indiana University has found that those bots make most of the accounts that spread the automated fake news. The automated fake news is rapidly becoming a large-scale business. It is no longer about just the student writing from his garage, for a few hundred dollars a day. Now the game is moving on the real disinformation campaign. The aim is often to get to influence government elections, or perhaps even the performance of the stock market. Given the volumes, automation has now become a requirement. Indeed, we can say that it is likely that the mere falsification of text-based news will soon be no longer sufficient. The technology is almost ready to falsify stories, also creating images, video, and audio completely from scratch. Nowadays, accessibility to big data has made possible the development of Artificial Intelligence algorithms without precedents. In the end, we switched from analysis algorithms to generative algorithms almost without realizing it. The automatic image synthesis has already started gaining traction. Software like Pix2Pix, for example, is able to create photo-realistic images from sketches through Adversarial Neural Networks4. Today new technologies emerge with increasingly surprising results almost every day: StackGAN, for example, implements two stages of adversarial networks, one that produces the first level of low-resolution images, and a second stage that on the basis of this input produces a more refined hi-res image, which is practically photo-realistic. What’s wrong? Well, first of all, Françoise Hardy is now 735, and the voice that is heard for those who had not already recognized it is that of Kellyanne Conway. But the surprising thing is that it is not just a video of Françoise Hardy dubbed with the voice of Kellyanne Conway, but an entirely generated video. It is, in fact, a work of Mario Klingemann, who was able, to “automatically” recreate the face of Françoise Hardy, lip-syncing to the voice of Kellyanne Conway! This was done through (again) adversarial neural networks, trained with old video clips of the singer. Another technology worth mentioning is DeepStereo, which from different images of places can “predict” and reconstruct scenes as if they were taken from different points of view. Because it’s about working directly on raw audio files, the technology is not yet commercially available, but it’s there nevertheless. The problem with “raw” audio files is that it requires very heavy sampling (up to 16k per second). Moreover, structures of these type of files tends to emerge at various time scales (see below). For example, Google has developed Wavenet, a convoluted neural network that during training is fed with human voices in the form of raw wave files. Wavenet determines the sampling value in each step, based on the probabilistic distribution of the network. In the end, the network is even able to reproduce “filling” sounds such as breaths, stuttering, etc. (listen below for an example). The results, compared to other technologies already used by Google, are much better and in the case of Mandarin are also even quite close to the human performance. The progress in image generation and video has been going on pretty fast so far. Keeping this growth in consideration, it is not difficult to think of a near future in which it will be possible to forge photographs and videos of scenes that never happened. Also, it will likely be possible to put in people’s mouths completely fake phrases out of nothing. The world of fake news and disinformation is about to enter a new radiant era where the only limit is imagination, and the difference between “fake” and reality will be increasingly blurred. 1. To get out of it was reported that the observations were terminated due to a fire that would have reduced the magical telescope and the entire laboratory(!) to Ashes. 2. Social Text, a journal of post-modern cultural studies. 3. Subsequently, the editors of the magazine, even regretting having published the piece, published an editorial where they refuted Sokal’s conclusions on the alleged lack of rigor of the newspaper, claiming to have noticed the “bizarre” of the piece, but to have considered it an attempt honest to venture into the field of postmodernism philosophy by a physics professor. 4. It will be topic for a follow-up article. 5. When she was 20, Todd was not born yet, and Trump himself was obviously not yet president.